Windsor Carpets can offer a variety of competitively priced commercial flooring, varying from rubber to vinyl and carpets to woods. We supply and have supplied flooring solutions for a number of councils, interior designers, schools and building contractors. Whatever you are looking for, we guarantee we will find the right solution for your floor. If required we will include cost for uplift and disposal, floor preparation, cutting of doors and moving of furniture. 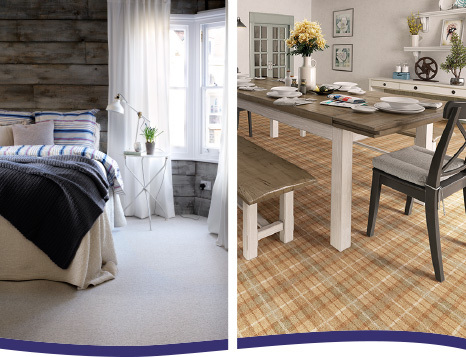 At Windsor we can offer contract carpets in rolls and carpet tiles. The versatility we have with sourcing various floor coverings means we are able to find suitable solution for restaurants, hotels, retail stores and other public commercial premises. As well as being a great option for many homes laminate flooring also has commercial applications for a wide range of businesses and organisations. Restaurants, retail stores, offices and multi-national corporations use laminate flooring in many different ways to create the right effect. We also offer vinyl floors from budget ranges to designer floor coverings such as Karndean & Amtico. Vinyl flooring is becoming a popular option for commercial use due to it being practical, hardwearing and now in many cases, slip resistant.